A former National Publicity Secretary of the Peoples Democratic Party, Olisa Metuh, on Wednesday asked the Federal High Court, Abuja, to order the release of his passport to enable him travel overseas for medical treatment. The News Agency of Nigeria reports that this is the third time Metuh would be asking the court to release his passport to enable him to seek medical attention abroad. At the resumed hearing, the judge, Justice Okon Abang, granted Metuh’s counsel, Mr. Emeka Etiaba (SAN) permission to move the application. Etiaba noted that his client did not appeal against the two previous applications, which were refused by the court; but added that this was a new and entirely different application. “It is instructive to note that the facts now are different from the facts relied on in the previous application. According to Etiaba, the exercise of discretion is always based on the material made available to the court and the ruling on the last two applications were based on material made available to the court at that time. He said his client, by the fresh application, was presenting a new case before the court in line with the new fact that had emerged and prayed the court to consider the application. On the claim that the court had said it would not entertain a medical report from any doctor in Nigeria with regard to Metuh’s case, Etiaba said they were relying on a letter from a neurosurgeon in the United Kingdom. In the opposing argument, the prosecutor, Mr. Sylvanus Tahir, prayed the court to dismiss the application on grounds that it lacked merit and was an abuse of court process. “The latest application, being the third in the series, is an abuse of court process, as the court has refused similar applications twice. According to Tahir, the only thing different about the latest application is the timing because the circumstance, which is the release of passport on the grounds of ill health, remains the same. The prosecutor noted that there was also no medical report from a foreign doctor attached to the application. Abang adjourned the matter until March 15 for continuation of arguments. 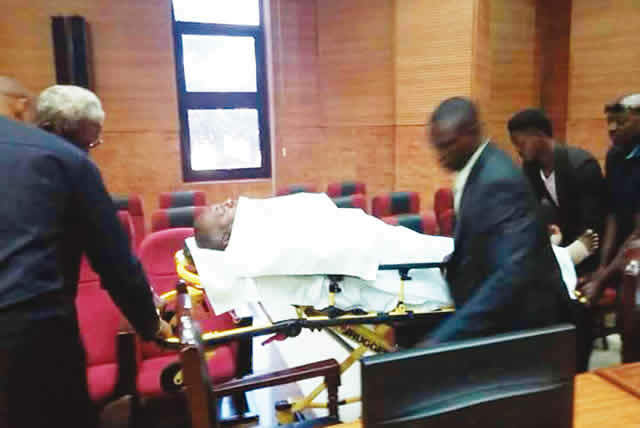 Abang had earlier refused another application seeking permission for Metuh, who appeared in court on a wheelchair, to be absent from the proceedings based on his health. The judge had also earlier raised the question as to whether the court, as constituted, had the power to hear the application seeking the release of Metuh’s passport.